We make recording gear for people who understand that great sound requires attention to detail and quality engineering. We only make and sell products that we would want to use ourselves. Over the past ten years, we have seen and serviced over 3000 microphones dating from the 1920s onwards. In those days things were built to last and, with a little love, can sound every bit as good now as they did when new. We want to bring back the quality and spirit of these antique instruments for today’s musicians, producers and recording engineers. Stewart Tavener is a scientist, musician, engineer and designer, and is known as the go-to guy in the UK for vintage ribbon microphones. Since 2007, Stewart has turned his joint obsessions with music and technology into a business, running a recording studio, and offering repair and restoration services for antique microphones through Xaudia. 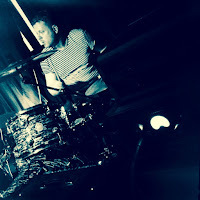 Adam Watson has been a musician for over 30 years with extensive live and studio experience, spanning different genres, instruments and recording techniques. Stewart and Adam have known one another for 15 years, working together on various artistic and commercial projects. Their joint obsession with vintage recording equipment led them to set up Extinct Audio. Our logo is inspired by a local legend. In the 7th century AD, Abbess Hilda of Whitby (later to become Saint Hilda) cast out a plague of snakes and turned them to stone. That’s why the beaches around the North Yorkshire coast are littered with snake-stones! In reality, these are fossil ammonites, which were often carved with heads to make them look more like the mythical snakes. EXTINCT & the ammonite device is a registered trade mark of Extinct Audio Limited in the UK and the EU.